The Roman recipe is very curious. The tastes are both familiar and strange, as we aren’t used to cumin being used in desserts. The pepper lingers on the back of your palate, lengthening the slightly spicy sensation started by the cumin. We used a sweet wine, but the slight tartness of a vinegar would be lovely with the other flavor elements. The syrup is very sweet, such that a small portion goes a long way. In the end, we decided the flavor would work beautifully as a chutney, or a side dish to a meaty main course, rather than a dessert. The modern recipe is pure decadence. 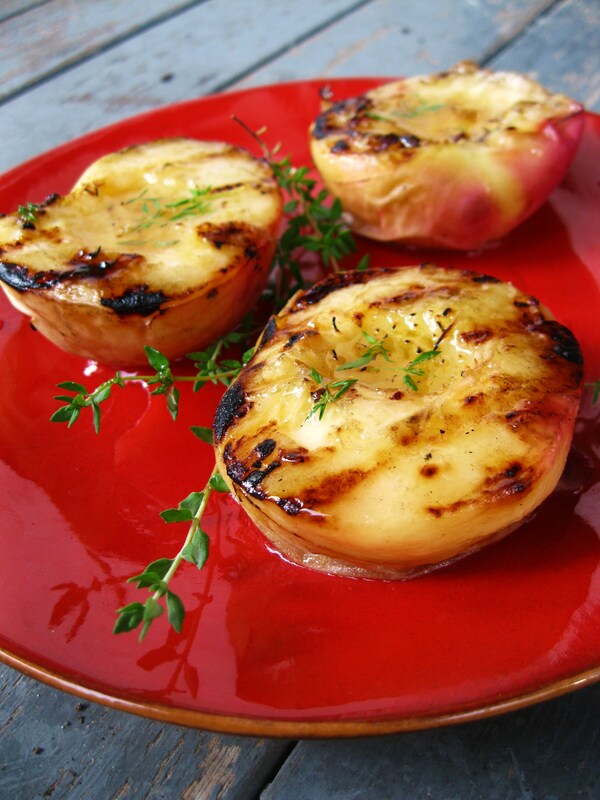 Grilling the peaches brings them to their absolute sweetness, and they half cook, making them reminiscent of peach pie filling. The thyme infused honey takes the sweetness and complexity to the next level. You will want to savor every single bite, and including a dollop of creme fraiche or vanilla ice cream will only add to the dish. So? The Roman recipe is what your favorite meat dishes didn’t know they were missing, while the modern version is a brilliant dessert. Both recipes are available in the Cookbook. This looks splendidly delicious! Oh, and which book did your quote come from? I don’t recognize it. my compliments on your cheffery. I’ve done the peaches in cumin sauce, and used the fish sauce as directed. It’s actually quite good- you don’t use a lot, just a dash and it deepens the flavors and there’s no fish taste at all. Wow, great to know! We’ll be more open-minded next time we use one of the Roman recipes! The translation I read has a footnote suggesting that the Persica in your recipe would be better translated as Persian fish, which makes sense to me, since Apicus also gives a recipe for cumin-sauce for fish. Clean hard-skinned early fruits[under-ripe peaches] remove the seeds and keep them cold in a pan. Crush pepper[meaning allspice, nutmeg and/or cloves], dry mint, moistened with broth, adding honey, raisin wine, wine and vinegar; pour this over the fruit in the pan, adding a little oil. Stew slowly on a weak fire, thicken the juice with roux [rice flour or other starch diluted with water] sprinkle with pepper [allspice] and serve. I think i’ll try it next time it’s not quite peach season. By the way, I love love love your website. Very inspiring. Just wanted to say how much I love your book. It’s become one of my favorite cookbooks. This morning I made the Roman recipe with chicken to send off in family lunches. I threw 4 chicken breasts in a casserole, added the four sliced peaches on top, and then poured a double serving of the sauce over all. I let it bake covered for around an hour, and it was to die for. The chicken was juicy, the peaches were perfect, and the sauce was out of this world. I also made the Renaissance Lemon cakes for an afternoon treat and froze the rest to enjoy later. Thanks for the wonderful recipes and inspiration.